In Faith’s last few weeks with us, life for her was becoming a struggle. However, she fought to the very end. We know that God was holding her in the palm of His hands. We witnessed her spirit rise the moment we removed the oxygen. She closed her eyes and went into a deep, heavy-breathing sleep. All that remained on the hospital bed was her shell. In short, absent a miracle, Faith had no chance. God wanted her. As Faith fought so hard for us, we decided we would do the same in her honor. We decided to continue Faith’s fight by making sure her light remains in all of us. We decided we would see to it that the medical world finds a cure in our lifetime. Because of the location of diffuse intrinsic pontine glioma (DIPG) tumors, there is no tissue for researchers. So, we requested an autopsy of Faith’s entire central nervous system.We had the entire brain and tumor tissue removed, as well as the spinal cord. In addition, we asked that her corneas be donated to the University of Miami to help someone else regain vision. None of the other organs could be donated, because they were all compromised from the cancer diagnosis and treatment. We asked Faith’s neuro-oncologist, Dr. Sharon Gardner at NYU Langone Medical Center, where Faith was treated, to coordinate with the doctors here in Florida, where we live and where Faith died. The neuropathologist at NYU relayed all the specific requirements to the pathologist in Florida as to what needed to be done and how to preserve the tissue prior to sending it out to NYU’s lab/tumor bank. NYU informed us that Faith’s brain/tumor tissue was only the second such gift donated in the last five years. 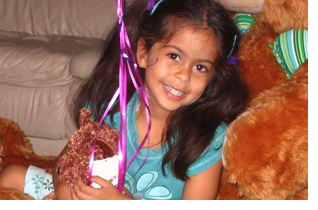 On Monday, Nov 10, 2008, we received confirmation that the NYU laboratory had received Faith’s brain and tumor tissue. The pathology report would be ready within six weeks. Three days earlier, when pulling up to our home from the cemetery, we had received a phone call from the University of Miami informing us that Faith’s corneas were healthy and had already been placed successfully in a 22-year-old young woman in Boca Raton and a 30-year-old man in Merritt Island, Florida. Though we didn’t get the miracle we so desperately prayed for here on earth — we didn’t get Faith alive and healthy — we did get the miracle of Faith’s corneas giving sight to two individuals. God is an awesome God! What are we going to do now? Faith’s fight is over. Ours has just begun. We’ll be praying and seeking the Lord’s guidance as we march forward. We’ll be working with organizations to help raise awareness and help raise funding for research. Without a doubt, we are a better family. We have blossomed from this journey. Many new friends and relationships have formed. Our purpose in life is now clear, and our need to be closer to God and our faith has deepened. May the good Lord continue to bless you and grant you His grace to accept the things you cannot change. Peace and our prayers are with all of you.